When people think of flying or buying their first plane, they often don’t think about how they will store it. Special considerations must be taken when storing a plane, so the proper equipment is vital. Airplane Hangers are necessary to store planes, and you can either buy or rent them. Certain factors may affect your decision to rent or buy such as cost, flexibility, durability, and safety. Corresponding risks in buying or renting also affect your decision. There are pros and cons to both renting your airplane hanger and buying it. This guide will help you weigh your options and make the best decision for you and the longevity of your plane. Hangars are necessary to protect and store many different kinds of aircrafts. Many different materials have been used to build hangars, including fabric buildings. Owners want durable and cost effective hangars for their planes. However, there are some hangars with more than a functional purpose. Although they can still store airplanes, there are hangars that are historic and well known. These hangars are famous around the world for various reasons and attract tourists and historians alike. Hangars of notable fame include the Spruce Goose Dome, Lockheed Air Terminal, Boeing Everett Factory, Hangar B, Aerium, Hangar One, and Hangar-7. Airports are important hubs housing passengers, cargo, airplanes, and vehicles. When planning an airport, it is complex and expensive, due to the many needs and services it must accommodate. While the complex nature of airports won’t change, good planning and flexible materials can make building an airport less costly. One way to lower costs is to use fabric buildings instead of traditional brick-and-mortar buildings. Fabric buildings are great for aircraft and cargo storage, passenger shelter, terminal buildings, and advanced systems. Fabric buildings are already part of the designs of some modern airports today. For example, the Denver International Airport uses fabric buildings and well known for it’s design. As airports receive updates and advance, fabric buildings find themselves as part of new designs. Buying an aircraft hangar is a huge investment with lots of factors to consider. Obviously your budget will affect your decision, but it’s important to consider the needs of your aircraft. Determine the basic needs for your aircraft to see what hangars are available to support those needs. The first consideration is location. Location can affect the cost of your project if you lease space or need to build roads, strips etc. Design type is the next factor. Pre-made options may be cheaper, but custom design may be needed if you have special aircraft. The layout is also an important factor, to maximize space for however many aircraft you must store. The materials you use such as door types, fabrics, and sheeting also determine the price of your hangar. You also must make sure your hangar is up to code and on proper foundation. Location plays a role in this as well because it often affects building requirements. This guide can help you consider all these factors to make the best purchase for your needs. With projections for one of the coldest winters ever, it’s important aviators and commercial airlines are ready for it. Planes are expensive assets that can be expensive to repair if damaged, so they need very good protection this winter. An airplane hangar is a sure way to protect planes from damage due to the weather. Alaska Structures offers strong, cost-effective airport hangars made from specially designed fabric. These hangars, in addition to being very strong and cost-effective, are customizable, tested to meet local standards, and flexible. 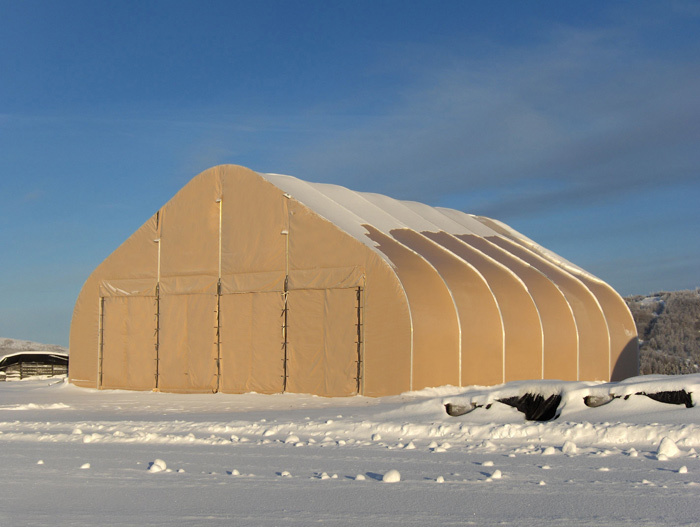 The fabric airport hangars have been tested in the field and will last this winter. If you own an airplane or other aircraft, you have a huge asset that needs protection from the elements. An Aircraft Hangar will provide this protection to secure your investment, and you have many options when choosing a hangar. One option is to use a fabric structure to protect your aircraft. Alaska Structures provides fabric structures, tested in harsh conditions for their strength, that are fast to set up. In addition to fast setup, these structures are customizable and cheaper than a brick-and-mortar style hangar. Learn more about the benefits of using the fabric aircraft hangars some government agencies have chosen to use. You may have your operations housed in an old building, wasting energy and driving up costs due to poor insulation, etc. Before you begin upgrades, it’s important to explore all your options for repairing an old structure or building a new one. Sometimes repairing an old structure can be just as expensive as building a new one, and both take a lot of time. Another option is to use a fabric building to support your operations, as they are fast and easy to setup. In addition, they are typically less costly than upgrades or a building a brick-and-mortar structure. Alaska Structures designs fabric structures with a host of benefits and ways to save and increase energy efficiency. How frustrating is it to spend a lot of money on a product, to open it and find it damaged from transport? Fabric structures, while more affordable than brick-and-mortar buildings, are a great investment that are often customized with many details. It’s important to find a company that takes the time to protect your structures from shipping damages, starting with its packaging. Alaska Structures fabric buildings are shipped in very durable rotomold containers that you can even reuse. This is an added bonus if you have operations that require a lot of moving because you can always protect your structure through transport. The design and bonus features of these structures can handle any rugged, mobile conditions.